Grow salad sprouts that you’ll eat later in the week. Encourage children to use words about plants such as seed and sprout and action words such as rinse and drain. Prepare ahead of time: Sterilize the glass jar by placing it in boiling water for 5 minutes. Let the jar cool. Then place 1–2 tablespoons of sprout seeds in the jar and cover the top with cheesecloth, securing it in place with a rubber band. Leave the cheesecloth in place and fill the jar with water. Let the seeds soak overnight. The next day, turn the jar over to drain the water thoroughly through the cheesecloth. Show children the salad sprout seed package and seeds. Ask if any children have eaten salad sprouts. Explain that they are very healthy and are good to eat in salads and sandwiches. Ask, What do you think we should do to get these seeds to grow into sprouts? Encourage children to share their ideas. Show children the seeds in the jar that you’ve soaked overnight. Explain that sprouts need to be rinsed and drained two or three times a day for the rest of the week and that everyone will take turns helping. Demonstrate how to rinse the seeds: Leaving the cheesecloth on top, fill the jar with water, then pour all the water out. It’s important to drain the seeds thoroughly after each rinse or the seeds will rot. 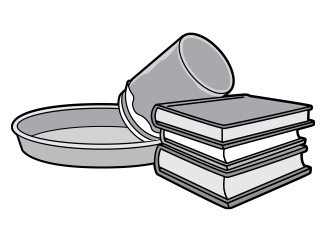 After rinsing the seeds, leave the jar upside down and tilted in an aluminum pie pan against books or other items (see illustration). Store the sprouts in the Watch Them Grow learning center. Cover the jar with a cloth or towel for the first few days to avoid direct sunlight. Have children rinse the seeds at least twice a day, perhaps during learning center time and right before the Closing Circle. Have children take daily photos of the sprouts and add them to the “Our Plants” chart. Encourage them to watch for the first sprout and the first leaves. Have children report to the group about what they see happening with the sprouts. Add some salad sprout seeds to the Seed Museum. Younger children may not be able to drain the glass jar themselves or position the jar at an angle. Help them when it’s their turn.